I wanted some extra spice to help fight a cold, and chai tea is just so comforting. I don’t drink caffeine, so I made it with rooibos. If you haven’t been able to like rooibos, this is the recipe to do it with. The chai spices fill it out a little. 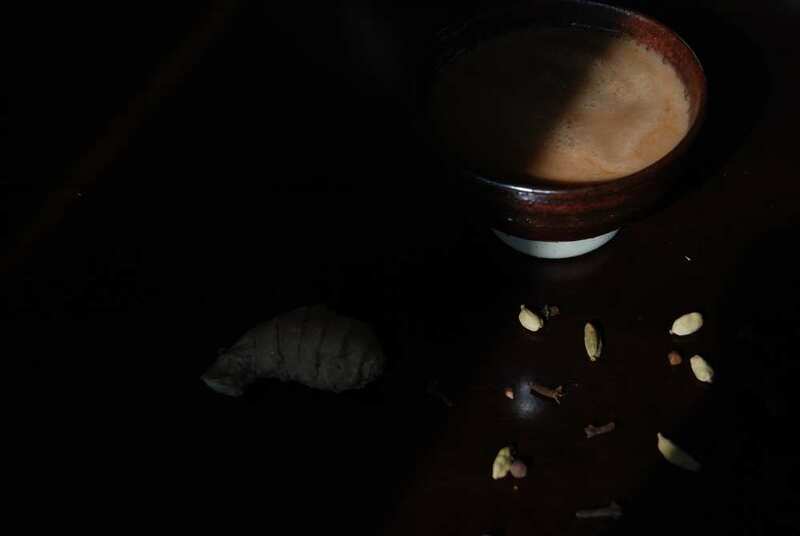 I remember as a child going with my mom to an Indian family, who showed us how to make chai tea. There was lots of milk and copious amounts of sugar. We’ve enjoyed it ever since, made with whole spices. I can’t handle casein, so I made it with ghee (clarified butter). I also tried it with coconut oil instead, and while it was alright it didn’t have the same creaminess as ghee. One sip and I was sure it was the best tea I had ever had. Make sure you blend it with a blender/immersion blender, otherwise you’ll end up with floating oil scum. Not so appetizing. You can, of course, use tea bags but I highly recommend giving this a whirl. The flavour is incomparable. I don’t recommend ground spices either, unless you filter it through a coffee filter. The optional ingredients are if you want to give it an even greater health kick. This would make a great gift as well, just substitute candied ginger instead of fresh, mix the spices and rooibos loose tea and package in a pretty bag or jar. Slice ginger, crack cardamon pods, and put all spices into a small pot with the water. Bring to a boil and let simmer for 5-7 min. 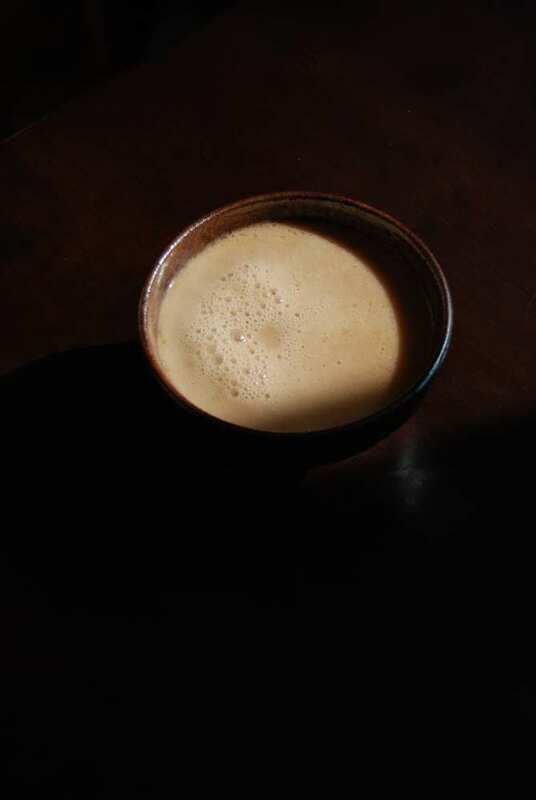 Turn off the heat, stir in the rooibos, and let steep for 5-6 min. Strain tea into blender or tall container for immersion blender. Add ghee, and optional sweetner (I like a tsp of honey), coconut oil, and/or gelatin. Blend for 10-15 sec. Pour into cups and savour. Have you tried butter in tea or coffee? How did you like it? Thanks so much! I’m still learning so much, I love the process. Sounds interesting. Never had ghee in tea before. Visiting from Tasty Tuesdays Link Party. I hadn’t either, but it’s my favourite now! That’s what my sister said, that she likes hot buttered rum, and I realized I’ve never actually tried it. Guess I’ll have to remedy that! ooh Im so glad you blogged about it! I am equally in love! My mother mentioned the same thing about the hot buttered rum as well, so I guess we will have to try it! I love ghee but sometimes the taste is not appealing to me, I think it’s because I ate SO much on the GAPS diet that I cringe a little when I smell or taste it. But, im glad the ghee is creamy! I missed creamy foods when I was casein free. I have almost all of those spices you used and I LOVE rooibos tea so I can’t wait to try it out! I have never made my own chia, and I am REALLY picky about the blend so I can’t wait to try yours. 🙂 Also, you know Anna Cools? She is one of my dearest friends here in the Pacific Northwest. Its a small world. Naomi, I use ghee in lot of cooking never tried in tea, sure I will try and let you know . Thanks for sharing with Hearth and Soul blog hop. Swathi, thanks for hosting! I hope you like it! I love unique recipes, and this is one of them. Thanks for sharing on Real Food Fridays, new party tonight at 7 central. I’m glad you enjoyed! Thanks for hosting, see you there! I LOVE tea! Thanks for the awesome recipe and sharing at Savoring Saturdays! I’ve pinned it to my Drinks board on Pinterest to make it later. Thanks for hosting and pinning! Hope you enjoy! You will be featured at Savoring Saturdays tomorrow morning. Congrats and I hope you come back this week! Thanks so much! Glad you like the recipe! I’ll be there for sure. The only way I like coffee is a tsbp in a cup of milk. Or in ice cream. 🙂 My husband drinks plain black coffee and I just can’t. I hope you like the chai blend – allspice isn’t actually from India, so it’s not a classical chai spice but I had that in my cupboard. Star anise is good in it too. Hope you like it! Thanks for hosting! 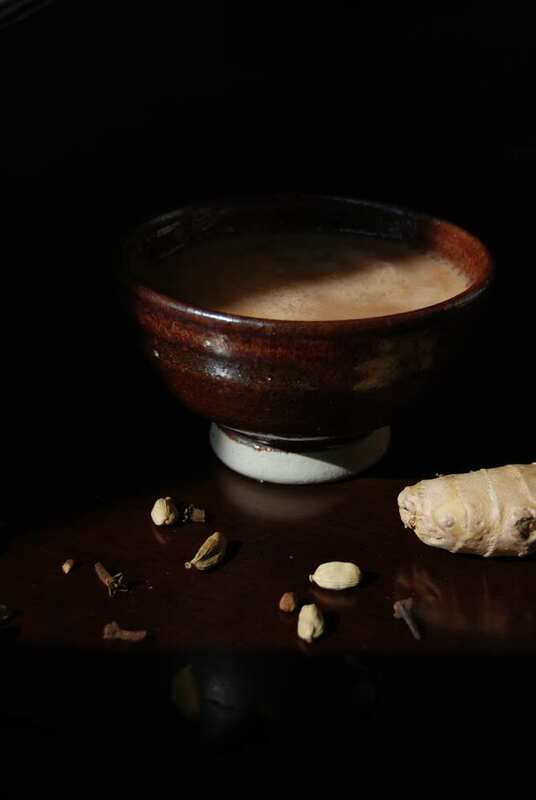 Ghee in chai tea is a common home remedy for persistent, dry cough in Northern plains of India. For medicinal purposes, you substitute honey for sugar, and add some ginger juice instead of ginger. 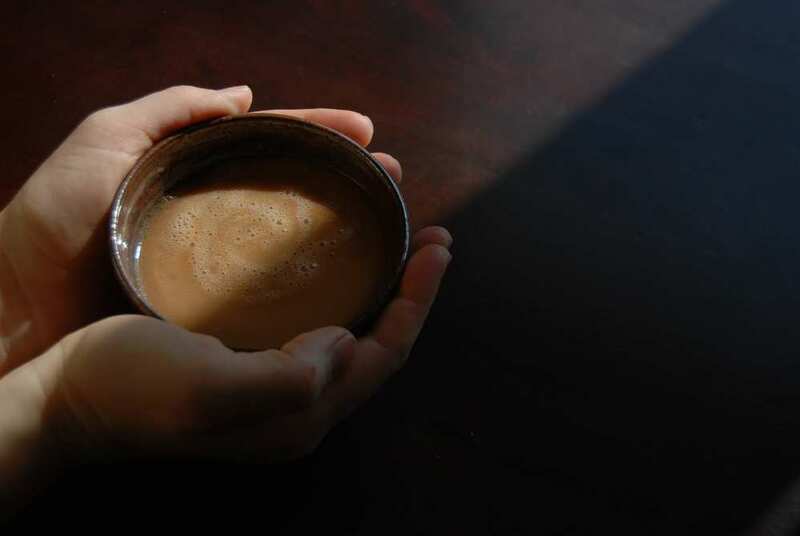 Ever tried yak butter milk tea? I was privileged to have it made for me, in a yurt, but a Mongolian woman. Delicious! I’ve bought the packaged ones, but cannot even compare them! I drink Rooibos black, usually. Coffee too. That sounds AMAZING!! Mongolia is high on the list of places I would like to visit, drinking authentic yak butter milk tea in a yurt sounds so cozy.